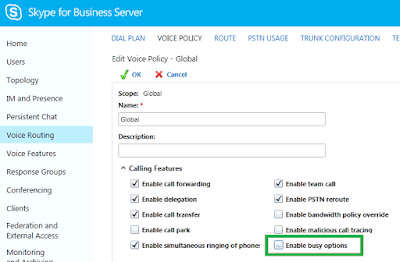 How is the SIP URI defined in Skype for Business Online? Can the SIP URI be changed? - Yes! I ran into an issue today, where we have registered an additional DNS Domain with the customer Office 365 tenant. It was necessary changing the SIP address to the new domain. Set-CsUser -identity user -SipAddress sip:user@newdomain.com is not working! ERROR:Unable to set “SipAddress”. This parameter is restricted within Remote Tenant PowerShell. This should be just used as basic approach on how you can support busy on busy. The newly created appliance will be loaded during the Frontend server startup procedure and you will be able seeing a not in Event 30253, indicating the application was included in the loading process. Here you will find a pre-defined set towards busy on busy. Here you can enable Busy on Busy on a GLOBAL Policy or based on USER/ SITE policies. This how-to guide is written in technical level 200 for Pre-Sales Consultant and the second half reaches leave 400 for Office 365, Sonus Cloud Link CCE Appliance and the Session Boarder Controller. We start from the Pre-Sales consulting process and the associated arguments. The Pre-Sales and Consultants will learn how the Cloud Connector Edition is working, technical deep drive inside CCE and last but not least the configuration of Office 365 Skype for Business Online and the wizard based CCE installation. Followed by a common scenario with Cloud PBX and multiple sites across different regions. The Office Online Server (formerly know as Web App Server) in Office 365 and On-Premises are identical in their feature and functionality. Nevertheless, if you are hosted on Office 365, you have limited support procedures. You have to assume that the OOS Server is working correctly in the Microsoft Datacenters. It is necessary understanding the workflow for PowerPoint presentation in Skype for Business troubleshooting connection issues. While if you operate On-Premises Office Online Server, you have to validate your own topology and deployment. As the OOS Server is not only useable for Skype for Business PowerPoint presentations, it also supports all other Office Application, like Word, Excel or OneNote.